And so it went. I started to remember what had happened during the last song when people couldn’t sit any more and leapt up following the mesmerizing “Amidinine”. 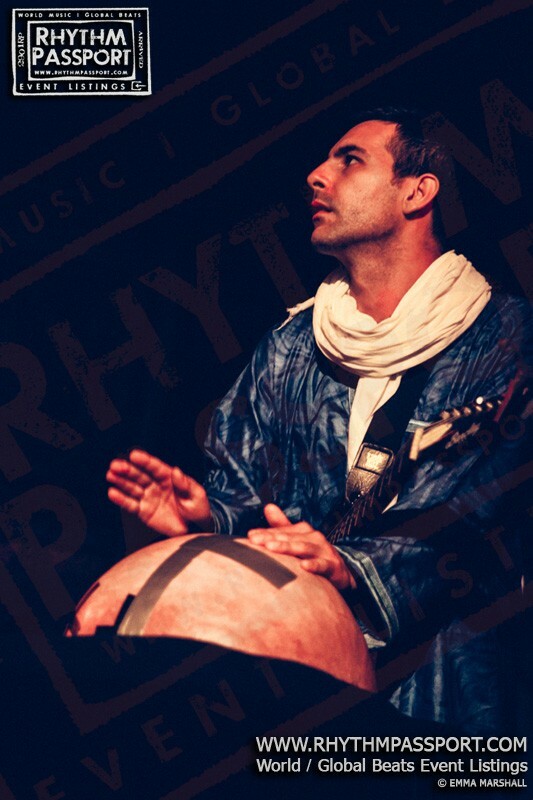 Then everything came back in sequence:“Tar Hani”, “Azamane Tiliade”,“Ahoulaguine Akalinea”, “Her Tenere”… one song after the other, each tune weaving seamlessly into the next creating an hypnotizing atmosphere that entranced the listeners for two hours. 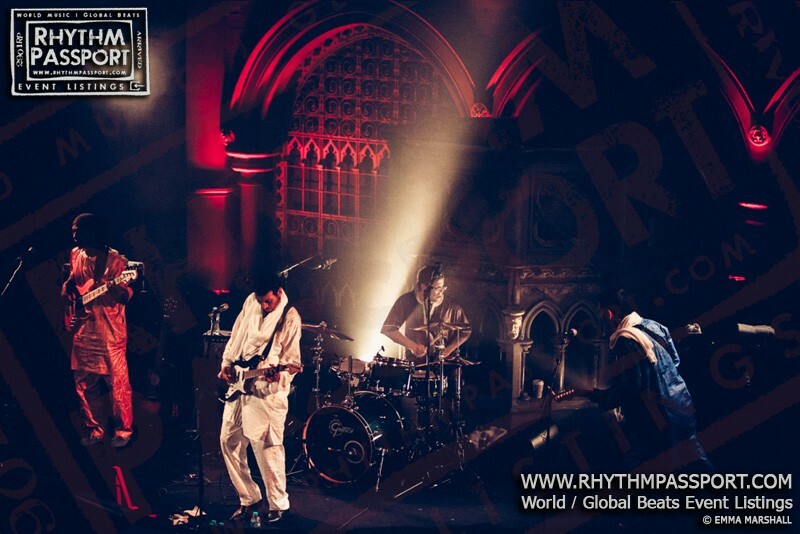 The Union Chapel’s hall became an impromptu Tuareg tent, surrounded by the church’s dramatic architecture and softly lit by candles and the scenic spotlights, the omnipresent hustle and bustle of London seemingly a thousand miles away. Even though there was no sand from Sahara under our feet or a line of dunes on the horizon, the forceful feeling of harmony and communion which joined the musicians and the audience together inspired a spontaneous musical family. A sharing experience during which the musicians and audience were figuratively communicating with one another was invoked. 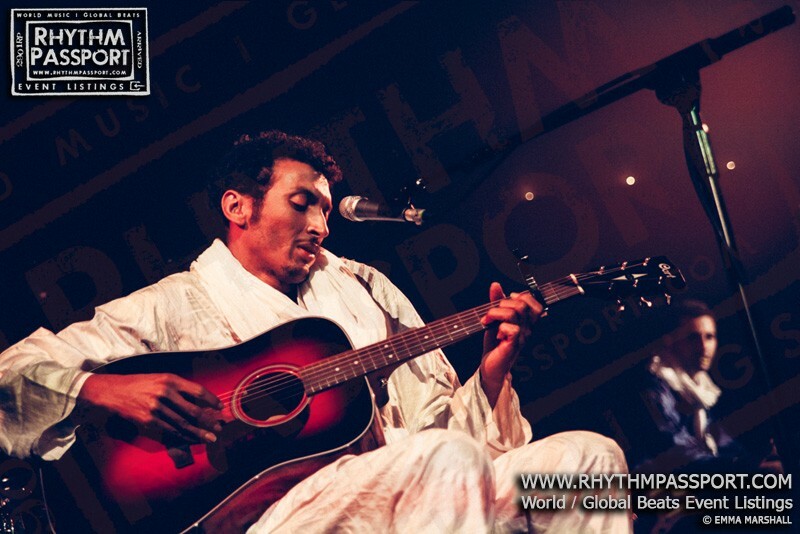 Bombino achieved this through his polychrome musical expressions, through his ability to juggle between acoustic, blues or rock styles. Meanwhile the spectators honoured the show, respecting the musicians with a religious silence, letting the lulling rhythms to cajole them, but also clapping their hands and repeating the chorus when the tempo speeded up and the music became more muscular. 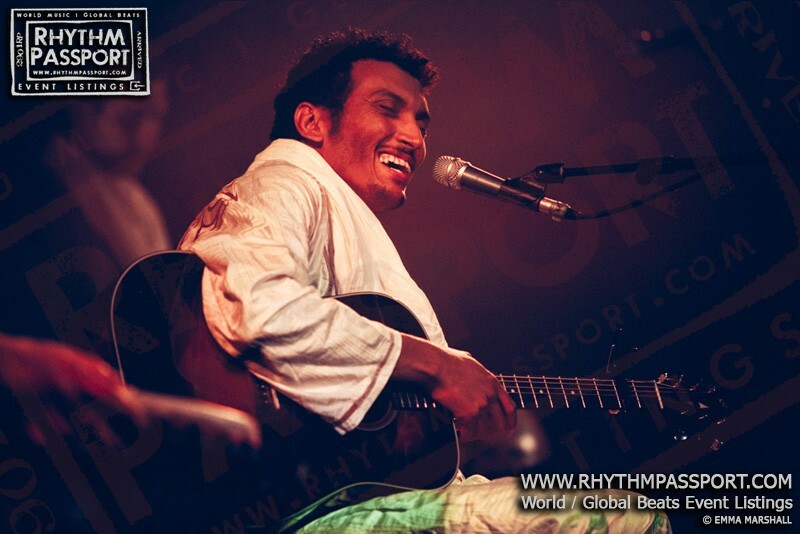 And so Bombino went through all the stages of his past and more recent productions. 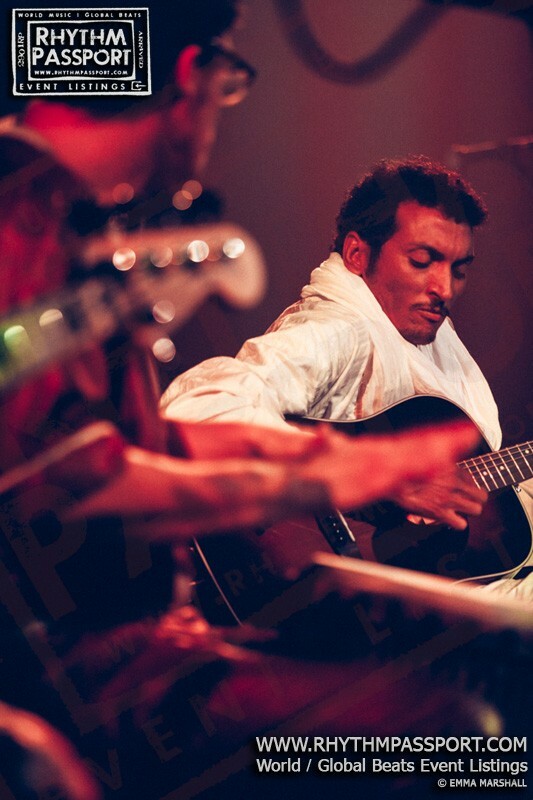 Songs from “Guitars from Agadez”, “Agadaez” and “Nomad” alternated with one another, showing the pathways and developments that had occurred in the Tuareg artist’s career. On stage his natural demeanor and simplicity were remarkable. Musical sparring partner the Gambian kora Master Jally Kebba Susso supported him and performed alongside him during his performance. His band members, despite their origins far from the sands of Sahara, appeared at ease with the distinctive desert sounds, entertaining themselves and the audience, playing together with absolute complicity. 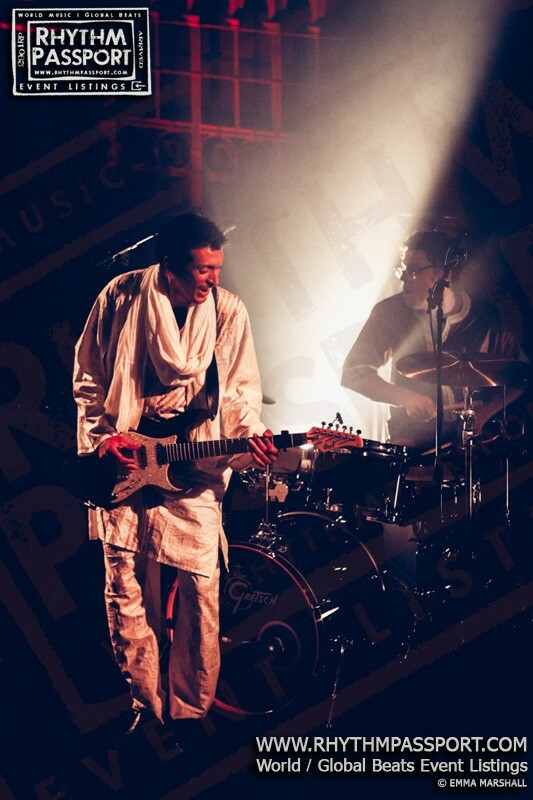 Then it was all about Bombino’s artistry, his unmistakable nasal, dry and incisive voice, his expressive guitar. 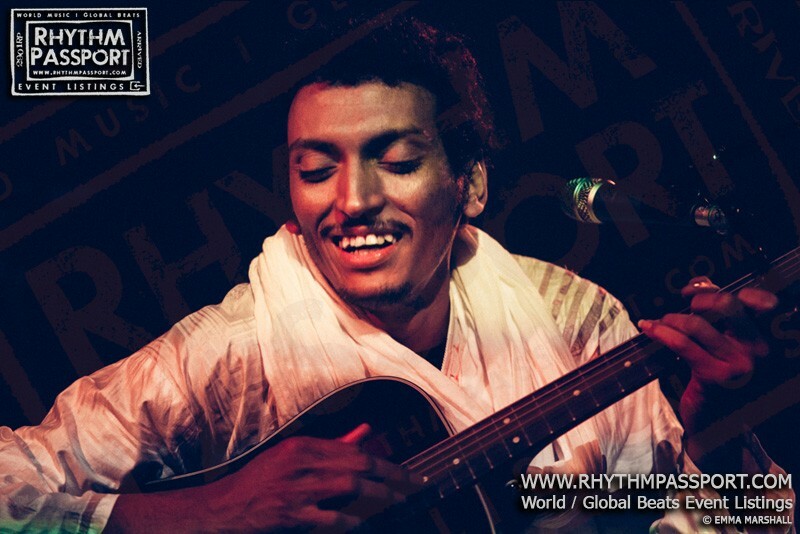 Bombino’s trademark, however, is his unique language, the Tamasheq dialect. But although hardly anyone understood what he sung it seemed as though everyone figured out the meaning and the significance behind the lyrics. No explanation was needed. Music and words flowed through the evening as a unique stream and all the pieces, once again, went together. 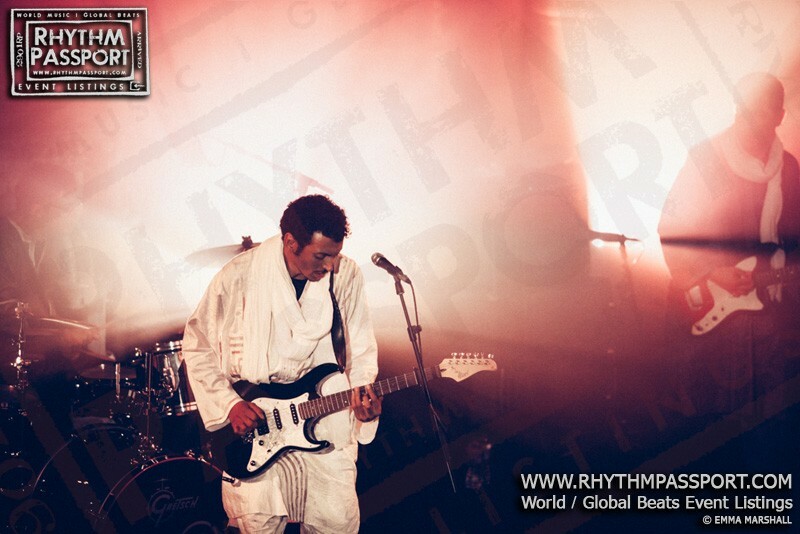 A few hours before the show we had the chance to have a little chat with Bombino. Despite his tiredness, due to a “never-ending tour” which is leading him around the world without a day off, he found some minutes, many smiles and interesting words to share with us. 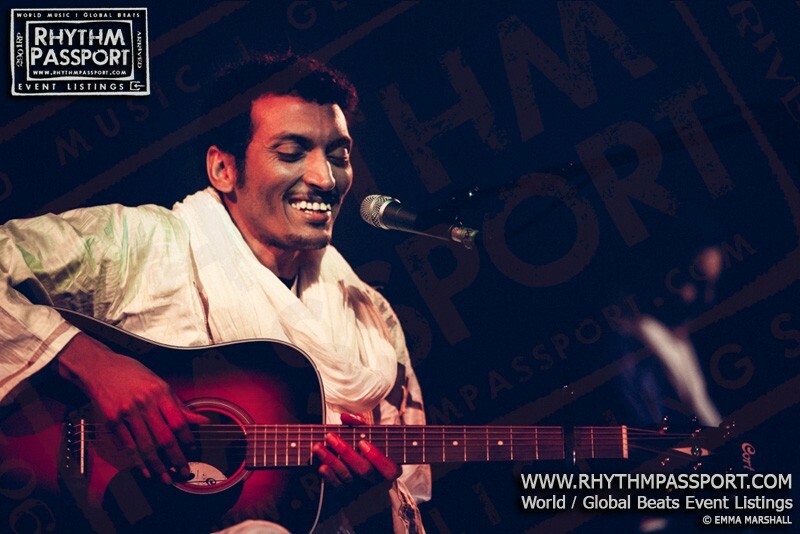 RhythmPassport: Since we have always wondered where it comes from, let’s start talking about your stage name because to us Bombino sounds really Italian! 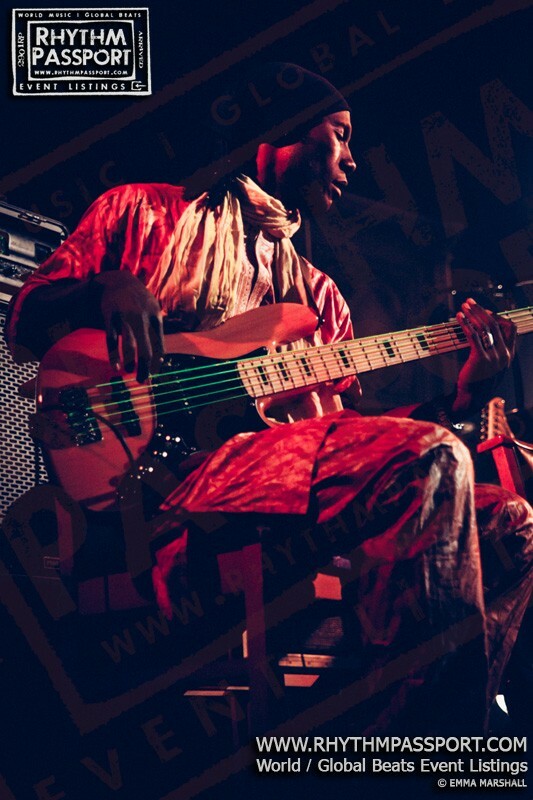 Bombino: Yes, yes, you are right. Well, you have to know that many Europeans are still living in Niger, and many Italians too. So, the Italian language is very popular there. When I was a child during the ‘80s, it happened that everybody was calling me “bambino”, which means “kid” in Italian, because I was the youngest among the musicians I was playing with. Hence, I’ve decided to keep that nickname with me, to change it a little and let it become my stage name. During the ‘90s, we also decided to call my first band Group Bombino. 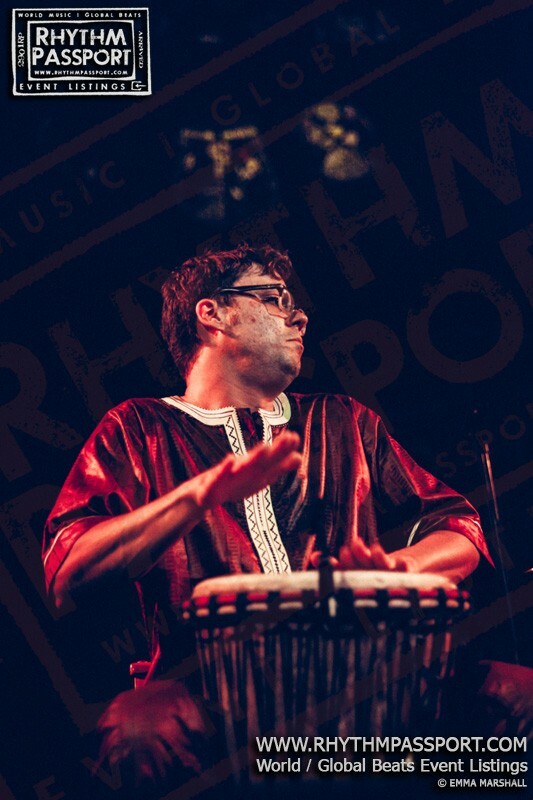 RhythmPassport: To change topic and talk about your concept of music, you once said that music is a powerful force, stronger than any weapon. In addition you said that your guitar represents freedom for you. How can a musical instrument be an instrument of freedom? 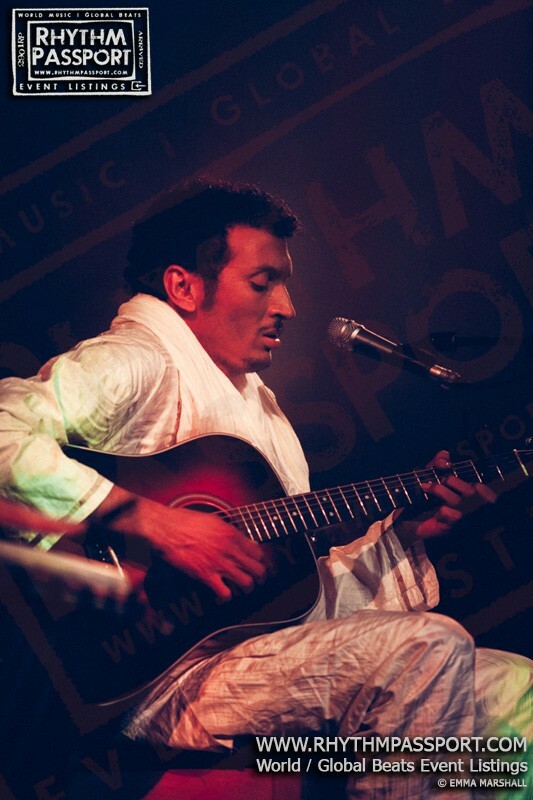 Bombino: The guitar is something that I love, that I’ve always loved. It is so important to me that is like my other half. Since I was 9 or 10 years old I grew up with a guitar next to me, and I also spent all my youth playing this instrument. It is true that it is just an instrument, but in my life there’s nothing more important. I’ve spent some of the greatest moments of my life next to my guitar. It is like a friend to me. 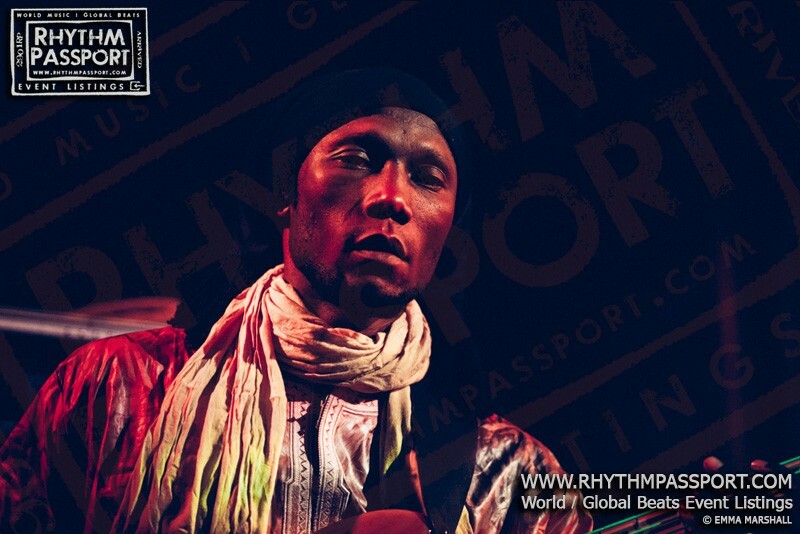 RhythmPassport: We have read that you don’t come from a family of musicians, nor you were educated to become one. How did you get in touch with music and how did you decide to keep on playing it? 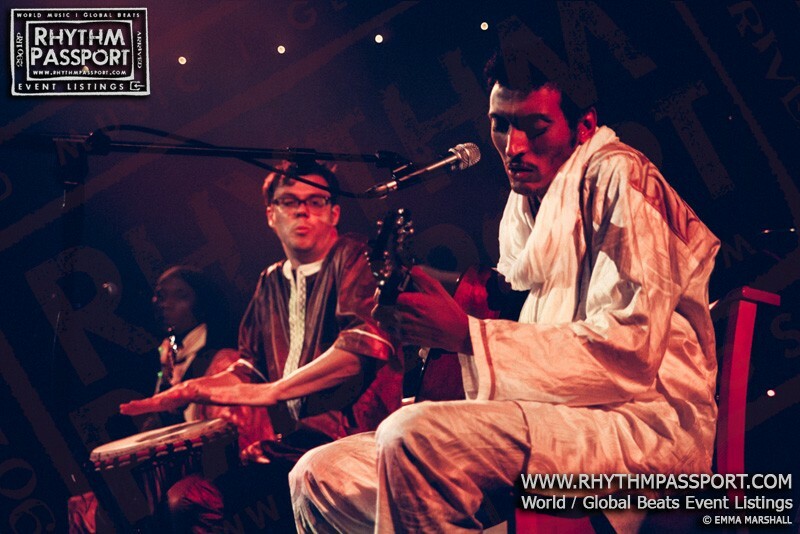 Bombino: Everything started off with some friends, when I was young. We used to play together looking and copying other musicians older than us who were coming to our camp. We were playing together not for the music but for friendship, to be next to each other. That’s why I have always wanted to have a guitar near me. It was like having my friends always next to me. 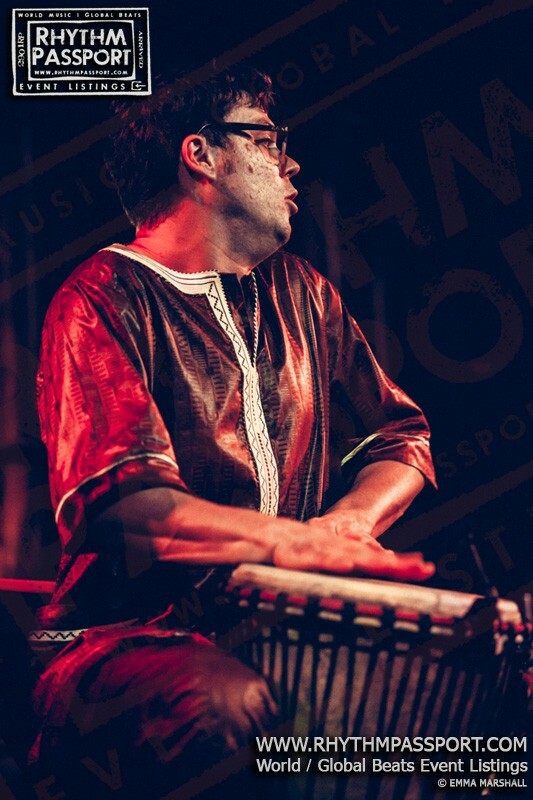 RhythmPassport: You have never kept the lid on your passion for rock-blues. You have always revered African bluesmen like Ali Farka Toure, but also respected and admired American and European ones like Jimi Hendrix and Mark Knopfler and this is clearly mirrored in your music. How is to combine and compare such different, but in a way similar music styles? 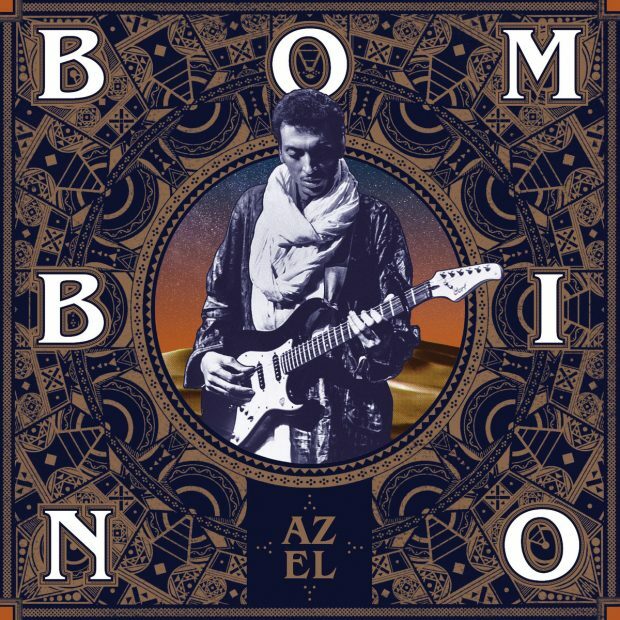 Bombino: Sure, there are great differences between these styles, but I think that music is like an open door through which everything flows in, mingling with everything else. Music is like a mélange. It is a continuous mix between styles and genres. Playing those styles that come from different backgrounds at home in the desert with all the things that happen there, with that particular political and social situation and that particular environment is something unique. It inevitably changes the form of the rock or the blues. 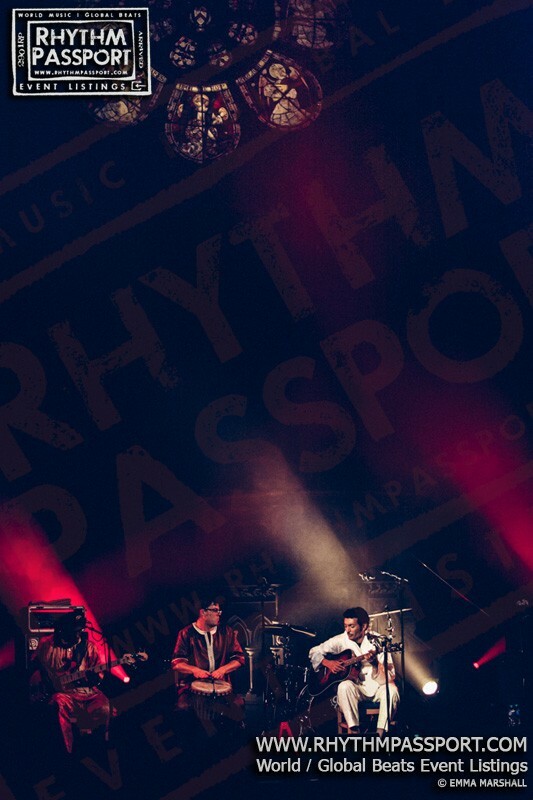 RhythmPassport: Are you a fan of these particular forms of blues and rock? Do you identify yourself in these styles? 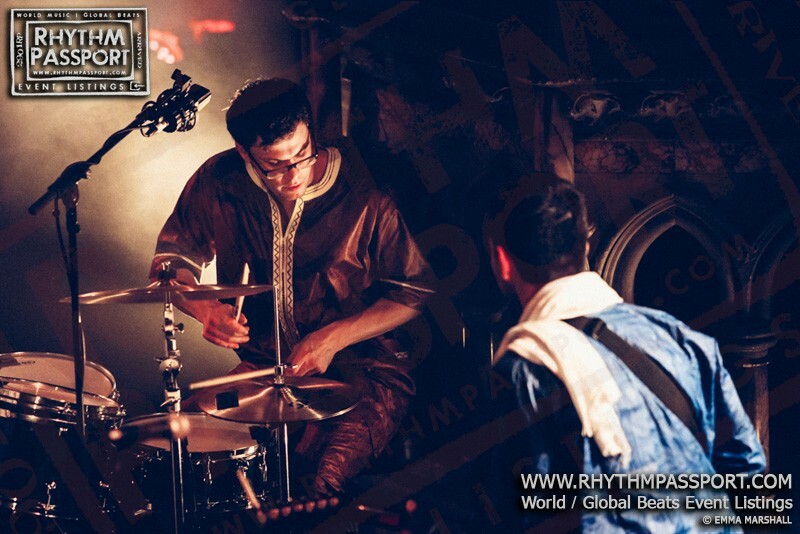 Bombino: Yes, I like to listen to bands coming from Northern Africa and the Sahara region. I’m still a great fan of Tinariwen. I love many new acts that play desert blues and I’m always looking forward to discovering someone no one else has heard of. But, at the same time, I also like to look abroad because I think that music is a continuous give-and-take. 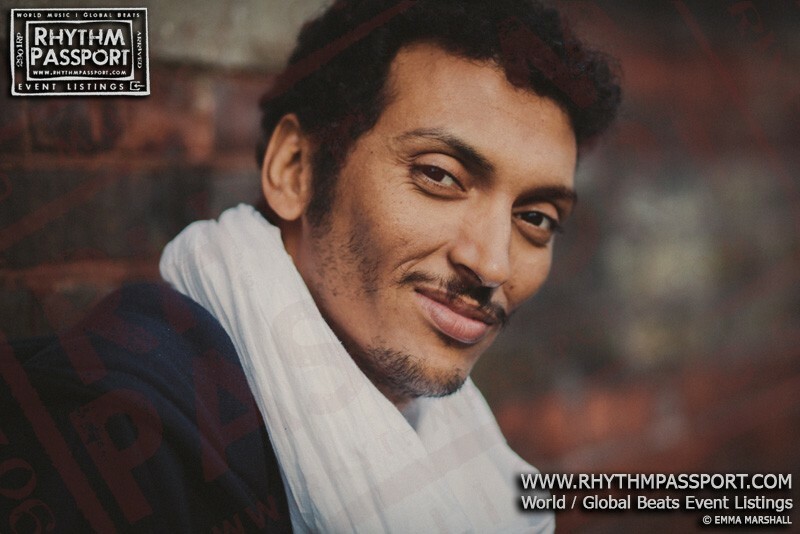 RhythmPassport: Your manager told us that you have an agenda packed with dates. You are playing a lot of gigs, almost one per day, all over the world. Have you also found time to think about other projects? 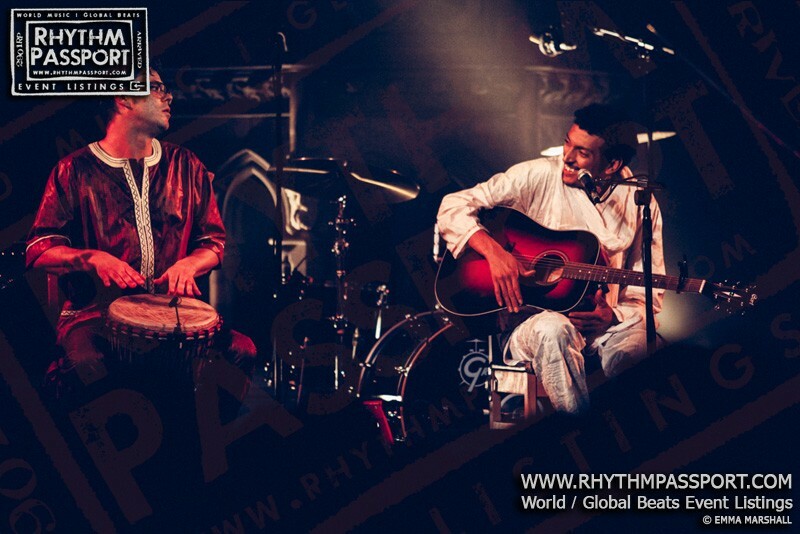 Bombino: Yes, we’ve been travelling a lot recently, playing many gigs and participating in many festivals all over Europe, but also in the States and Canada, but we have also a new album ready to be published. RhythmPassport: Can we ask you when? Will it happen in 2015?